He returns to our world - now dominated by the hour-counting he so innocently began - and commences a journey with two unlikely partners: one a teenage girl who is about to give up on life, the other a wealthy old businessman who wants to live forever. To save himself, he must save them both. And stop the world to do so. Interesting thoughts about what time means and how much it rules our lives. I am very much a clock watcher and I hate to be without my watch. I can see how it sort of takes over my life in getting places at certain times. An interesting look at humanity and the importance of individuals and relationships. I don't much care for the style of writing. It's very simplistic and at times annoyed me that way. I also thought it kind of ignored how we do have to pay attention to time to function in our world. Not everything associated with keeping time is bad. Not much nuance there. There's a nice line between being obsessed by it and acknowledging it's importance. This one looks weird. Probably not my cup of tea. 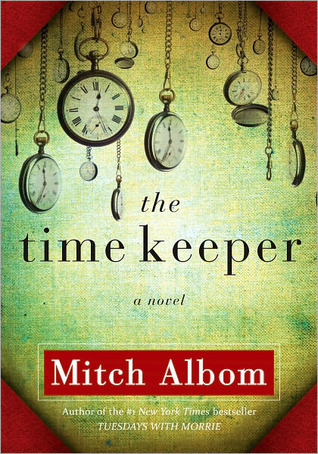 Have you read any other books by Mitch Albom? I read Have a Little Faith earlier this year and loved it. And I'm about to start his newest book next week. Sorry to hear this book wasn't as enjoyable for you. I really loved his nonfiction, Tuesdays with Morrie, but this one was just out there for me. I think I'd prefer his nonfiction over fiction.